Jio Play Beats Netflix and Amazon; Hotstar on Top! Jio's 2nd position is the biggest surprise here as is Netflix's last position! Jio Play, which was launched last year in September along with Jio’s telecom services, has become India’s 2nd largest on-demand entertainment app. This steep rise of Jio Play within 12 months is indeed an amazing case study to understand the impact of almost free Internet provided by Jio. These numbers were revealed in the latest report on the performance of on-demand entertainment apps by App Annie. And the surprising news: Hotstar is #1 in this category, as Netflix falls to #5. The report highlights the fact that after the number of eyeballs watching TV has become less than those watching a smartphone’s screen, the rise of on-demand entertainment apps in India is amazing. Add to it the factor of subsidized, sub-Rs5000 smartphones, and we have a massive audience of Internet savvy Indians, hungry for on-demand entertainment on the go. Hotstar has emerged as India’s #1 entertainment app, as they dominated both the number of users and number of hours spent on the app. Compared to August last year, Hotstar demonstrated 100% increase in user base: they have 67.5 million users right now, compared to 33 million last year in August. On the same hand, hours spent on their app was 15,574 million minutes in August 2017, which is double of 4,739.8 million minutes last year in August. Surprise Of The Year: Jio Play Beats Netflix! But the biggest surprise in this report was the amazing rise of Jio Play within 12 months. Netflix, which has revolutionized the concept of on-demand entertainment, and is the biggest player globally, has been humbled by Jio Play in India. 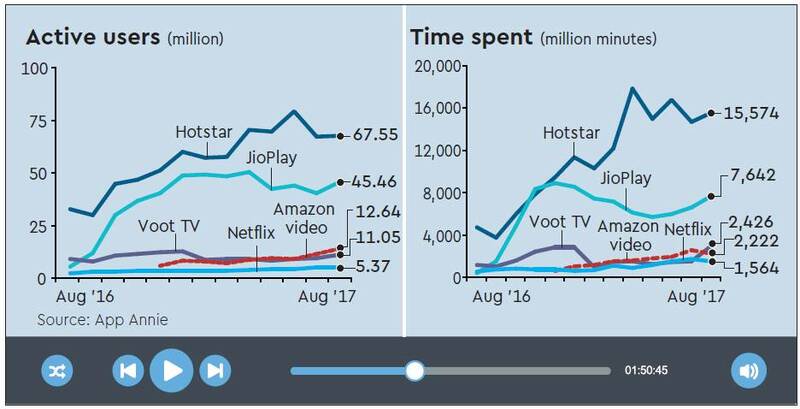 As per the report, Jio Play has, at the end of August, 45.46 million users, which is 4X that of Amazon Video, and 9X of Netflix. On the other hand, the total number of minutes spent on Jio Play was 7642 million minutes in August, which was zero last year! No doubt Netflix also managed to massively increase their user base, as they have 5.37 million users in August, 2017, compared to 2.56 million last year. Besides, the total number of hours spent on Netflix in August this year was 1,563.5 million minutes, which is 150% more compared to August 2016. Interestingly, Amazon Video also experienced massive boost in both, number of users and total minutes spent. And, in both the counts, they have also beaten Netflix by a comfortable margin. While Hotstar is free, it also comes with a Rs 199 subscription plan. Netflix charges Rs 700 per month and Amazon Video is bundled with Amazon Prime, which costs Rs 499 per year, but very soon is going to be Rs 999. Which is your favorite entertainment app? Do let us know by commenting right here! "Surprise! Jio Play Beats Netflix and Amazon; Hotstar on Top! ", 2 out of 5 based on 3 ratings. GST Simplified – Small Businesses, Ecommerce Get Huge Relief; Tax Slab Reduced For 27 Crucial Products! Netflix, Amazon Prime Video or Hotstar – Who’s the Best? We Find Out! This is because Jio Cinema and Hotstar are free but Netflix and Amazon are paid. There is no surprise. This!!! ?????? Coupled with the reason many users involved in such bandwidth-burning activities are majorly Jio® users sums it up. ‘Dear,’ “Journalism 101” requires that you get your facts right before publishing. Doesn’t matter whether you cry “dearth of funds” or “new media” but as long as you long for that label, you ought to do this basic step. ? In case you still haven’t got it, let me “spell-it-out” for you: There’s no legit app as “Jio Play[sic]” in the entire time-period you mentioned at all. Not by ‘Reliance Jio Digital Services Pvt. Ltd.’ developer [on the Google® Play™], to say the least. ? Nope. The article is misleading and y’all getting swayed by it! There’s no current-title of any genuine app offered by the developer ‘Reliance Jio Infocomm’ at all, at least not in the period of time referenced. Moreover, the moniker implies that it’s not for Live-streaming but merely on-demand content, and that’s exactly what the report must’ve tried to say. Awesome!! :) Good to see an Indian brand taking on American biggies! :) – however, I, personally, have no idea what Jio Play *offers*, cause I’ve never used it – but will it offer big budget, CGI-and-VFX-filled blockbusters like the American ones do?? (kind of hard to experience all that on a *phone*, right?) I *hope* so. Dear, you need to know about the film-distribution business first. While your enthusiasm is pretty apparent, but please try to understand that movies are majorly made available on the basis of long-term content deals (i.e. “contract”) with the studios (i.e. what we call as either “production houses” and “distributors”) rather the production values of the content, even if it happens, it’s rare enough to be deemed negligible! But mind you, this has nothing to do with selection based on narrative-quality which takes place sometimes and fortunately, gradually gaining trend. Bro, don’t sermonise me or call me “Dear”, please. ….and I didn’t understand that long winded sentence up there – you sound like you’re talking nonsense.